Guest post by Lindsay McClure, a passionate writer and multimedia content producer who is lucky enough to call Hood River, OR her home. Originally posted on Faradaybikes.com. Riding a modern e-bike is an addicting feeling. I’ve found that when I’m riding, my mind often starts sewing plans that will get me, and everyone I know, spending more time in the saddle. A similar experience set wheels in motion at Oregon E-Bikes. 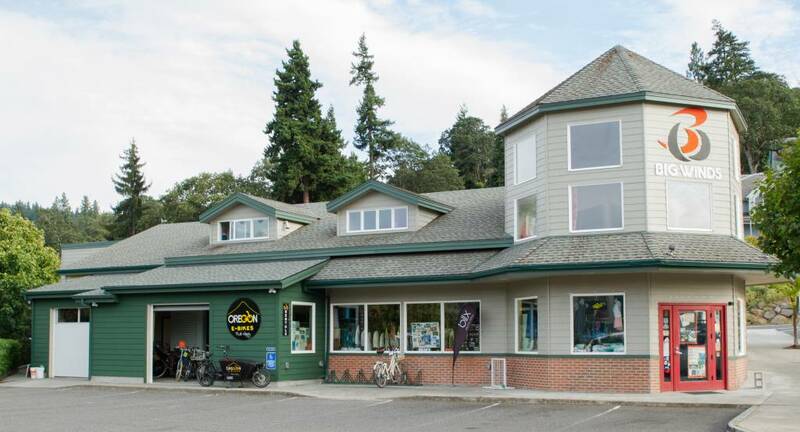 Oregon-E Bikes is a sister store to Big Winds, one of the largest windsurfing, kiteboarding and stand up paddleboarding product and accessory outfits in the United States. Both shops are located in downtown Hood River, OR. Steve Gates, owner and founder of Big Winds, is an avid adventurer, strong as an ox and stubborn when he needs to be. In May of 2016, Steve was in the middle of chemotherapy and an all-out assault on cancer. Still, he didn’t want chemo to prevent him from doing the things he loves, and he started thinking that an e-bike might help him to stay connected with his family and the outdoors. When he started shopping around he found that, in many stores, the e-bikes were positioned in a forgotten corner in the back of the shop. As a retail store owner for 30 years, Steve was disappointed when he felt that his only option was buying online. He also sensed an opportunity. Big Winds managers Jodie Gates and Matt Morrow started thinking about all of their friends and coworkers who prefer to bike instead of drive. They recognized how many of their neighbors resort to driving their cars when they’re running late or have stuff to transport. Compared with cars, e-bikes are kinder to the environment, more economical, better for the rider’s health, easier on the town’s infrastructure and more fun to ride — while being fast and equipped to haul cargo. It seemed like the perfect solution. Steve and the team envisioned Oregon E-Bikes as a sidecar attached to Big Winds, and they started sketching out plans. In March of 2017, Big Winds blew a hole in the front wall of their retail store to make room for an addition that would house the new bike shop. Oregon E-Bike’s official opening was in May of 2017. Jodie, Matt, and Steve are dedicated to getting Hood River residents out of their cars, and they’ve seen steady progress toward this goal since opening the store. One of Jodie’s unofficial roles at Oregon E-Bikes is getting new riders hooked on the products. When she took me out to test ride a Faraday Cortland, we went straight to the base of notorious 7th Street, the steepest climb in town and the last place I want to find myself when I’m on a bike. With my Cortland in “boost mode,” I flew to the the top of the hill. I didn’t have to snake or switchback, and I was amazed when I found myself at the top without dripping in sweat. While it’s fun to describe the experience of riding a Faraday for the first time, you really have to try it yourself and experience their “Sweat Less. Smile More.” motto first-hand. If you’re lucky enough to find yourself in Hood River, stop by and say hello to the Oregon E-Bikes team.